For any soil Cohesion (C) and Angle of Internal Friction (Ø) are two important engineering properties, which indicate the shear strength of soil. These two parameters are required for design of slopes, calculation bearing capacity of any strata, calculation of consolidation parameters and in many other analyses. Direct shear test is used to predict these parameters quickly, especially in cohesionless soils. Loading Frame, Weights, Proving Ring, Micrometer Dial Gauge, Sample Trimmer or Core Cutter, Stop Watch, Balance, Spatula, Straight Edge, Shear box grid plates, porous stones, base plates, loading pad and water jacket shall conform to IS : 11229-1985. The balance of 1 kg capacity, sensitive to 0.1 g.
IS 2720(Part 13):1986 Methods of test for soils: Direct shear test. Reaffirmed- 2016. Undisturbed Specimen -Specimens of required size shall be prepared from the undisturbed specimen collected from field in accordance with IS : 2720 (Part 1)-1983. Cohesive soils may be compacted to the required density and moisture content, the sample extracted and then trimmed to the required size. Alternatively, the soil may be compacted to the required density and moisture content directly into the shear box after fixing the two-halves of the shear box together by means of the fixing screws. Cohesionless soils may be tamped in the shear box itself with the base plate and grid plate or porous stone as required in place at the bottom of the box. The cut specimen shall be weighed and trimmings obtained during cutting shall be used to obtain the moisture content. Using this information, the bulk dry density of the specimen in the shear box shall be determined. 5.1 Undrained Test- The shear box with the specimen, plain grid plate over the base plate at the bottom of the specimen and plain grid plate at the top of the specimen should be fitted into position in the load frame. The serrations of the grid plates should be at right angles to the direction of Shear. The loading pad should be placed on the top grid plate. The water jacket should be provided so that the sample does not get dried during the test. The required normal stress should be applied and the rate of longitudinal displacement/shear stress application so adjusted that no drainage can occur in the sample during the test. The upper part of the shear box should be raised such that a gap of about 1 mm is left between the two parts of the box. The test may now be conducted by applying horizontal shear load to failure or to 20 percent longitudinal displacement, whichever occurs first. 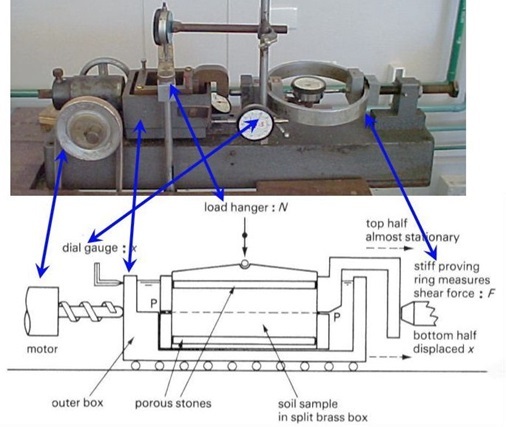 The shear load readings indicated by the proving ring assembly and the corresponding longitudinal displacements should be noted at regular intervals. If necessary, the vertical compression, if any, of the soil specimen may be measured to serve as a check to ensure that drainage has not taken place from the soil specimen. At the end of the test, the specimen should be removed from the box and the final moisture content measured. A minimum of three (preferably four) tests shall be made on separate specimens of the same density. NOTE - As porous stones are not used for the undrained tests, plain plates of equal thickness should be substituted in their place so as to maintain the shear plane in the sample in the middle of its thickness. 5.2 Consolidated Undrained Test-The apparatus should be assembled in a way similar to that given in 5.1 except that instead of the plain grid plates, perforated grid plates and saturated porous stones should be used at the top and bottom of the specimen. The procedure is same as in 5.1 except that after the application of normal stress, the vertical compression of the soil with time should be recorded [IS : 2720 ( Part 15 )-1986. The shear test should be conducted only after complete consolidation has occurred under the particular normal stress. The rate of shear should be such that water does not drain from the specimen at the time of application of the shear load. At the end of the test, the specimen should be removed from the box and the final moisture content measured. A minimum of three (preferably four) tests should be made on separated specimens of the same density at different normal stresses. 5.3 Consolidated Drained Test-The shear box with sample and perforated grid plates and porous stones should be fitted into the load frame.After application of normal stress which is done in increments [ see IS : 2720 ( Part 15 )-1986, the sample should be allowed to consolidate. When the consolidation has completely occurred, the shear test should be done at such a slow rate that at least 95 percent pore pressure dissipation occurs during the test in this calculated time factor. At the end of the test, the specimen should be removed from the box and the final moisture content measured. A minimum of three (preferably four) tests should be made on separate specimens of the same density at different normal stresses. 5.4 The normal stresses to be selected for the test should correspond to the field conditions and design requirements. δ = displacement in cm. The longitudinal displacement at a particular load may be either noted directly from the strain dial readings or calculated as the product of the corresponding time reading and the strain rate, allowing for the compression of the proving-ring, where applicable. The stress longitudinal displacement readings should be plotted and the maximum stress and corresponding longitudinal displacement together with the normal load applied during the test recorded. NOTE : In general, failure in direct shear may be considered to take place either at maximum shear or at the maximum obliquity of the Mohr failure envelope. If the failure is assumed to take place at maximum shear and not at maximum obliquity, the angle of shearing resistance thus obtained will be smaller, giving an error, if any, on the safe side. It should, however, be noted that differences in the values of the angle of shearing resistance obtained by using the two criteria mentioned above are more important for sands than for clays. The maximum shear stress and the corresponding longitudinal displacement and applied normal stress should be recorded for each test and the results should be presented in the form of a graph in which the applied normal stress is plotted as abscissa and the maximum shearing stress is plotted as ordinate to the same scale. The angle which the resulting straight line makes with the horizontal axis and the intercept which the straight line makes with the vertical axis shall be reported as the angle of shearing resistance and cohesion intercept respectively. NOTE : The normal stress-maximum shear stress relationship may not be a straight line in all cases. In such cases, the shear parameters may be obtained by drawing a tangent to the normal stress expected in the field. In the case of the consolidated undrained and consolidated drained tests, the load at which the specimen is consolidated and the consolidation characteristics as determined during the consolidation part of the test should also be reported. In the shear box test, the specimen is not failing along its weakest plane but along a predetermined or induced failure plane i.e. horizontal plane separating the two halves of the shear box. This is the main drawback of this test. Moreover, during loading, the state of stress cannot be evaluated. It can be evaluated only at failure condition i.e. Mohr’s circle can be drawn at the failure condition only. Also failure is progressive. Direct shear test is simple and faster to operate. As thinner specimens are used in shear box, they facilitate drainage of pore water from a saturated sample in less time. This test is also useful to study friction between two materials, one material in lower half of box and another material in the upper half of box. The angle of shearing resistance of sands depends on state of compaction, coarseness of grains, particle shape and roughness of grain surface and grading. It varies between 28o (uniformly graded sands with round grains in very loose state) to 46o (well graded sand with angular grains in dense state). The volume change in sandy soil is a complex phenomenon depending on gradation, particle shape, state and type of packing, orientation of principal planes, principal stress ratio, stress history, magnitude of minor principal stress, type of apparatus, test procedure, method of preparing specimen etc. In general loose sands expand and dense sands contract in volume on shearing. There is a void ratio at which either expansion contraction in volume takes place. This void ratio is called critical void ratio. Expansion or contraction can be inferred from the movement of vertical dial gauge during shearing. The friction between sand particles is due to sliding and rolling friction and interlocking action. 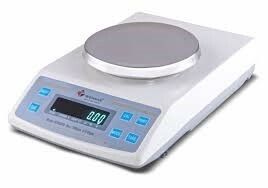 The ultimate values of shear parameter for both loose sand and dense sand approximately attain the same value so, if angle of friction value is calculated at ultimate stage, slight disturbance in density during sampling and preparation of test specimens will not have much effect. IS:2720 (Part-13) covers the methods for determination of shear strength of soil with a maximum particle size of 4.75mm in undrained, consolidated undrained and consolidated drained conditions.